Tumbleweeds the size of boulders streak past in all directions causing me to involuntarily close my eyes and make darts to the left or right behind the safety of the windshield. One sticks on the hood ornament and I lurch back with enough force to strike the head rest and then bounce back to an upright position. My motions would appear silly to anyone watching, but there isn’t anyone. I’m lost. Travel writers and guides never fail to recommend getting lost in such places as Marrakesh or Seville. All those twisty narrow lanes of mystery lead to experiences that fully engage the senses. Maybe not always gently; sometimes “onslaught” is a more accurate description. Onslaught or not, a memory is etched. THAT is the essence of travel. Getting lost gives the experience an “edge”, an emotional jump start. And road trip travel in places like Kansas is no different. Really. Those twisty narrow lanes of mystery in places with exotic names have nothing on what you can stumble across in Kansas. The first time through Mullinville was a mistake. If you read that sentence carefully, it’ll tell you that a second time was on purpose because the first trip was rewarding enough to go back. “What the? !” The wind is doing its best to alter the footing of the 5,000 lb. Yukon as I pull off the road. The sun is full-on but the barren landscape broken by the freaky signs, the desperate squeak of whirling buckets suspended as high into the Kansas atmosphere as the strength of a metal pole will support, the flags flapping out of unison, all screechingly collide into one perfectly produced Twilight Zone scene. It’s October so I pull on a jacket before picking up camera gear, zip it completely (I’ve learned a few things about Kansas wind), and get jerked out of the truck onto my side because I’ve learned a lot about jackets and Kansas wind, but I’m still learning about the wind powering open a truck door. I don’t bother looking around. There’s no one to have seen me. 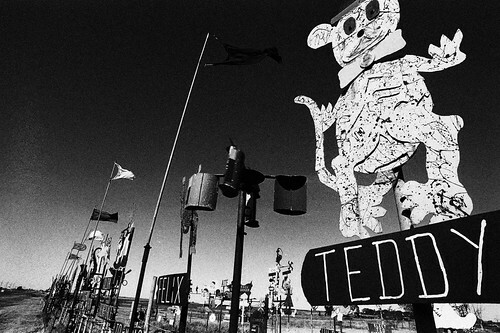 After gawking for sometime and taking in all the symbolism and dark humor, I begin taking photographs. A local barrels by on the highway and honks (he obviously knows the local law enforcement). His intrusion confirms I’ve not really landed in a Twilight Zone episode. There will be a 3rd trip. I still don’t have the shot I really want. 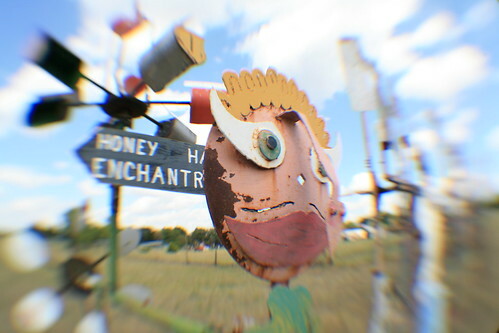 Maybe a Fisheye? Want to see all this for yourself? Head west on 54/400 out of Wichita, through Pratt. Mullinville is 41 miles west of Pratt, 120 miles west of Wichita. The Black & White photo taken during my March 2009 solo road trip, didn’t place in the Top 3 of the public voting (as you can imagine, the competition was top-notch). I’ve known about this for several days and while slightly disappointed, was grateful and humbled to have been given the Top 10 nod by the professional judges who sorted through the thousands of submissions. The photo is a winner thanks to all of your comments, encouragement, support and for slogging through the not-so-user-friendly USAToday website to log votes. With July 4th right around the corner, this post was begging for a re-run. They do it on TV all the time. The grandeur of granite rising from the cliffs of Mt. Rushmore will in one upward glance sweep away any countryman’s negative sentiments. And impress the hell out of everyone else. Mt. 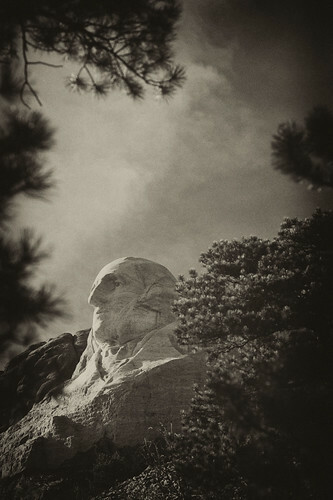 Rushmore is but one impressive sight however among many packed into the Southwestern corner of South Dakota. Air Force One over Mt. Rushmore. Wikimedia Commons. From my SRT in 2007. Anchored by Rapid City (airport code RAP), the Black Hills area still echoes with the report of Wild West Colt pistols. You can wander through Native American Indian Reservations as you contemplate what to take in first — the sights of Mt. Rushmore featured on the big screen in National Treasure: Book of Secrets, the cavernous limestone formations of Badlands National Park, Sturgis or the frontier town of Deadwood. Throw in the Crazy Horse Memorial, Custer State Park, Wind Cave National Park, the 1880 Train, Buffalo Gap National Grassland, the Geographic Center of the U.S., or the Minuteman Missile National Historic Site, and a week’s vacation can be easily spent in one of the most scenic and pivotally historic areas of the lower 48 states. And that’s before you even cross into Wyoming. Forget the guidebook, you’ll need only your Atlas and a penchant for discovery. Interstate 90 East of Rapid City will deliver you to Wall, South Dakota. If you’re already parched or ready for a stop, the Wall Drug Store offers refreshment, take in the National Grasslands Visitor Center, or search for the Minuteman Missile Silo. From there 240 South will take you directly to the scenic drive around the North Unit of Badlands National Park. The loop ends at Interior. 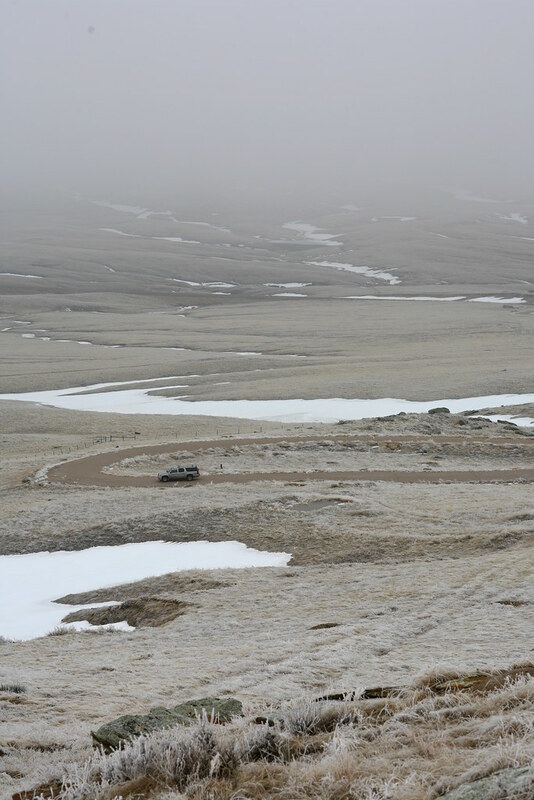 To continue into the South Unit’s 2.7 million acres of sprawling erosion of the Pine Ridge Indian Reservation, proceed past Imlay to Scenic, turning South at the first/only turnoff. You’ll need to stop at the White River Visitor Center to get permission to proceed into the Reservation. West on Highway 2, then North on Highway 40 to Redshirt will complete the South Unit. “Highway” 2 is a misnomer. The road is gravel, albeit wide and well maintained. Continuing past Redshirt on Highway 40 to Hermosa presents the choice of turning North on Highway 79 and back to Rapid City, or west on Highway 36 to 87 South to Custer State Park and Wind Cave National Park. From Wind Cave National Park you can easily hit 385 North taking you to Custer, the Crazy Horse Memorial, Mt. Rushmore, and the ‘1880 Train’ in Hill, as you progress northward. Scenic, SD. SRT in 2009. Native American Burial Platform -- South of Redshirt on Highway 40. SRT 2009. The area is deceptively compact. While distances aren’t great between any point (from Rapid City to Hot Springs on 79 is only 57 miles) you will not desire to cover any of it quickly. And the twists and turns of the roads preclude speed. While limited lodging is available in the smaller towns and in Badlands National Park, the high season summer months make day trips to and from your pre-reserved lodging in centrally located Rapid City conducive to combing the area. Once you’ve exhausted the sights south of Rapid City, 385 will take you to Lead (as in lead a horse to water), Deadwood, the Geographic Center of the U.S. in Belle Fourche, and Sturgis to the East just off Highway 90. Either of these towns is worthy of securing lodging if you’re ready to venture past the Rapid City anchor. Summer is high season though and Sturgis along with towns in the area are choked with bikers for the annual Bike Week Rally usually the first week in August. Deadwood is a personal favorite. Wild Bill and Calamity Jane are buried in the Mt. Moriah cemetery. Saloon 10 is where Wild Bill made famous the Dead Man’s poker hand of Aces & Eights when shot from behind by Jack McCall (hanged for his crime). The town, while a haven for gambling is replete with history and the nostalgic charm of false storefronts. Regarding FOOD, if you’ve got a nose for chocolate on the road, stop by The Chubby Chipmunk for a fix. For lunch, try the Deadwood Thymes Bistro. The last time there I had the White Bean & Chicken Chili, a Three-Cheese grilled sandwich with bell peppers and a slice of apple all melted together between perfectly browned, thick sliced bread, and a large, cold, creamy slab of their Peanut Butter & Chocolate Pie. I was hungry; the meal memorable. I’d like a repeat, please. 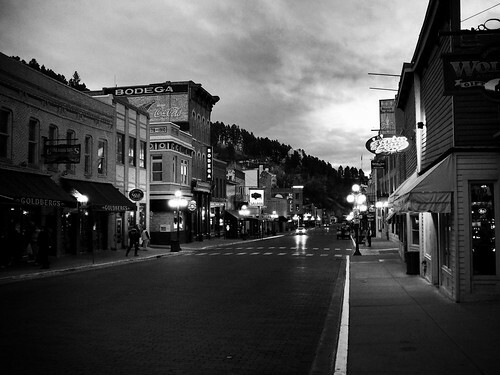 For dinner I sat one night on a perch over downtown Deadwood in the 2nd story location of Kevin Costner’s Sports Bar & Grill (above the Midnight Star casino on Main Street). While I don’t recall the food in the same longing manner as the lunch from Deadood Thymes Bistro, I do fondly remember the view and the numerous photos/posters of Kevin Costner in his Western movie roles. 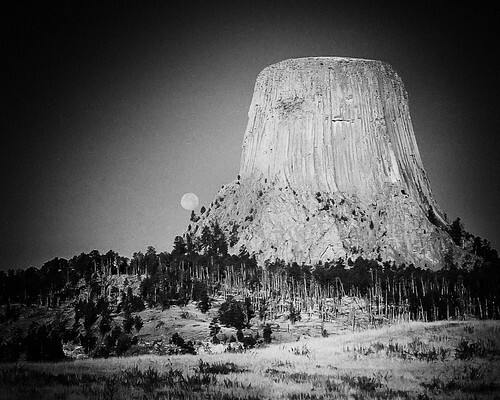 Devil's Tower National Monument, Wyoming. High ISO FILM. See the moon?! President Theodore Roosevelt Proclaimed Devil’s Tower the first National Monument in 1906. Many Plains Indians have legends associated with “Bear’s Lodge” and consider it a sacred site. The Kiowas legend goes like this: Kiowas were camped by a stream where there were lots of bears. Seven little girls were playing away from their village and bears took chase. The girls ran and just as the bears were about to catch them, they jumped on a low rock. One of the girls began to pray. The rock began to push itself out of the ground raising the children higher and higher. The deep grooves running down the sides are said to be made by the bears attempting to claw their way to the top. The rock continued to push the children upward into the sky so far they reside in the sky today as the pleiades star cluster. This Great American Drive will compel you to sing the Stars & Stripes and purchase a long, black duster. Be prepared. WARNING LABEL: If you decide to venture out of Belle Fourche to locate the original Geographic Center of the U.S. or anywhere in the above discussed areas, BEWARE of Rattlesnakes. 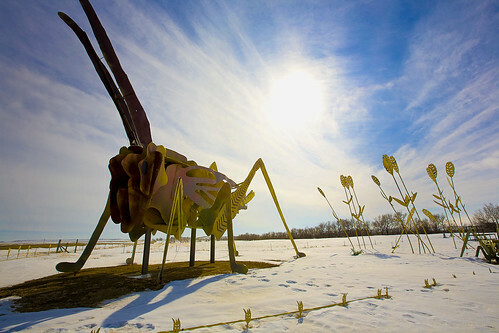 North Dakota’s Enchanted Highway is 32 miles of soaring, metal art sculpture that qualify as some of the largest in the world. 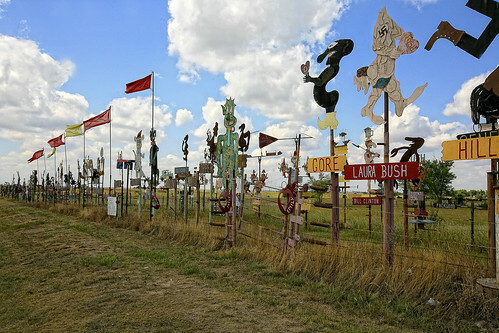 They are as unusual as they are enjoyable, qualifying unequivocally as must-see Americana Road Art. But the highway isn’t about the objects at all. 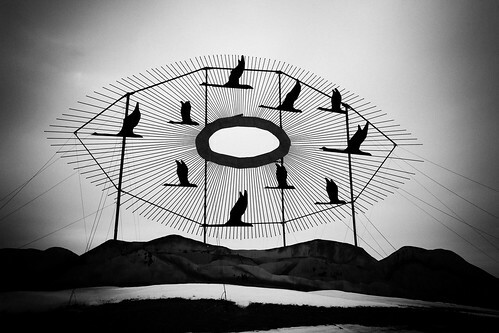 North Dakota’s Enchanted Highway is about a MAN and his singular vision. "Deer Crossing". The buck is 75-feet tall and 60-feet long. 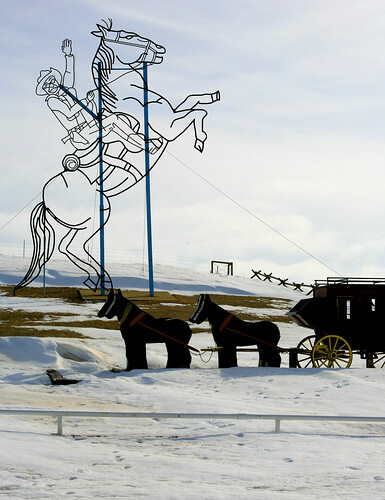 Erected in 2002. Made from old oil well tanks cut apart and welded to form the shadow design. 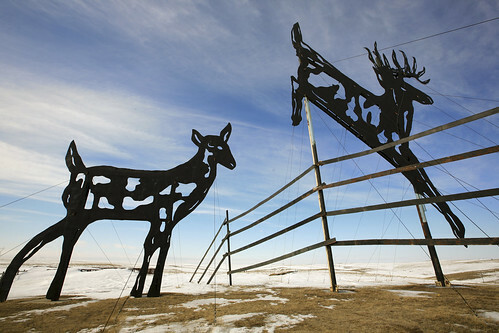 To fit through the streets of Regent, the buck's front leg had to be cut off and re-welded on-site. Gary Greff is a small town character. I only hesitate to say “hero” as I feel I don’t know enough of the story. However if you judge such things based not on the outcome but intent and the effort expended, then Gary qualifies. 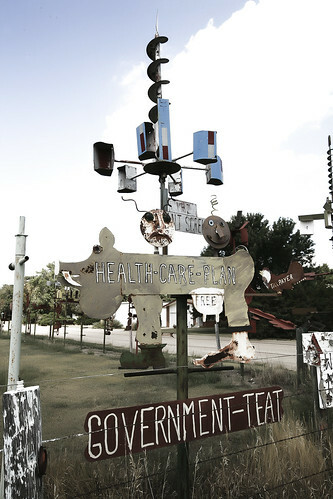 Near 60, Gary hails from a small town to which he was never able to break the tether (Regent, ND), lives below the poverty line but is tenaciously steeped in hope for his own life and for the survival of his hometown, and has spent the past 20 years fighting for a vision of betterment for his community. His young life in Regent was re-directed by tragedy. At 16, driving a motorbike with his 15 year old brother on back, Gary hit a curb in town. His brother died at the scene. People’s lives are shaped by such. After teaching school in various communities, at age 40 Gary moved back to Regent led by a vision to do something to curtail the demise of his hometown. He’d never pursued art of any kind. He couldn’t weld. And yet the sculpture below made it into The Guinness Book of World Records as the World’s Largest Metal Art Sculpture. It’s 110 feet tall, 154 feet long and weighs 79 tons. And photographs like any beautiful piece of art. "Tin Family". 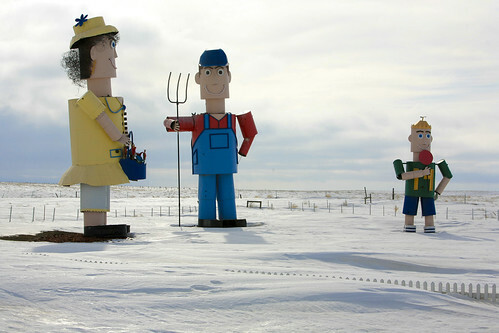 The man is 45-feet tall; the woman 43-feet tall; and the boy 23-feet tall. "Teddy Roosevelt Rides Again". 51-feet tall. A tribute to President Theodore Roosevelt's part in North Dakota history. Built from used oil well pipe. "Fisherman's Dream" (my personal favorite). 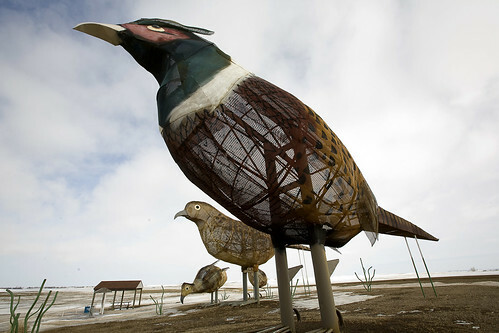 "Pheasants in the Prairie". Rooster is 70 ft. long, 40 ft. tall. Made of wire mesh that was originally used for screening gravel. Long process -- took 3 years -- the wire was heated and bent to form the bodies. "Grasshopper's Delight". 60 Feet long, 40 Feet tall. A reminder of the hardships farmers have overcome making their living off the land. Welded from old fuel tanks and oil well tanks. Gary Greff between 1989 and 2006 did all of this. And he did it amid harsh criticism, ridicule, accusations of insanity, the scorn of fellow townsfolk, one rebuff after another, and over time a severely curtailed financial and volunteer donor list. His brother Brad said, “people walked across the street to avoid him”. He did, what no other townsperson in Regent, ND has been able to do – he drew people to the area. And continues to. Gary’s art didn’t save Regent in the way he’d envisioned. The High School closed. 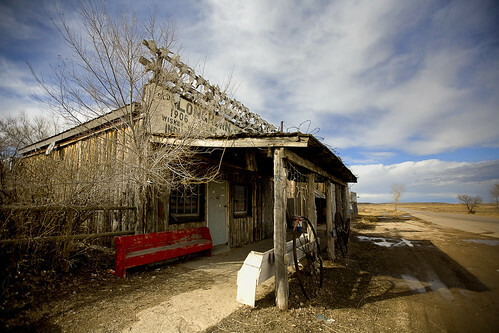 The town appeared to me to be a rural American small town clutching survival when I saw it in March 2009. Gary’s dream for an Enchanted Highway Theme Park and droves of tourists dropping their money in Regent hasn’t materialized. But his vision, hard work and undying commitment left a commendable and very memorable mark. Gary Greff is the best kind of dreamer – he takes action. 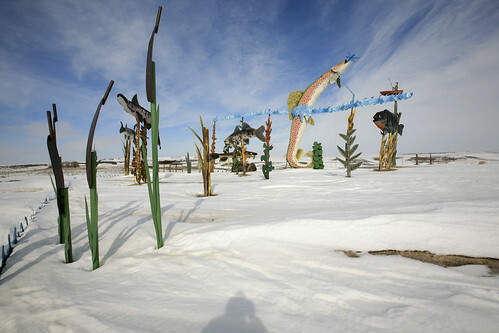 To see the Enchanted Highway and Gary Greff’s art, take Exit 72 (about 20 miles east of Dickinson, ND) off of I-94. The Highway runs due south from there and ends in Regent. There is no charge so if you see a contribution box, leave some currency behind. Heartland Chronicles is a series of radio documentaries set in and around Middle America, exploring the region’s people and communities. A concentrated focus on this region allows us to draw what author William Least Heat Moon refers to as a “deep map” – a careful, long-term exploration of place that reveals the truth of everyday life today. Here’s the 2005 interview with Gary Greff (the MP3 choice seems to work best). Of Rattlesnakes & The Geographic Center of the U.S. Clamoring on the steep incline under the weight of my heaviest film camera (reserved only for the most promising of discoveries), slipping twice to one knee on rime ice, I hitch one last gasp of frigid oxygen as my head lifts my eager eyes into perfect position to feast on the conquered monument. Sheepherder’s Monuments!? !*&#@%! “This is NOT the Geographic Center of the United States of America??! !” My lips are too numb to spew anything out, but my mind handles it beautifully in their stead. “I climbed all this way, alone in the middle of Greenland, South Dakota for THIS! ?” Kicking the fence while hanging on with one gloved hand to steady my footing, the shards of ice and frozen atmosphere target the only opening to my skin, right down the back of my neck. And if there’s any justice, hopefully into the dens of a few sleeping rattlesnakes. "Sheepherder’s Monuments or stone Johnnies survive the days of the open range. These stone columns were probably built to indicate distance and direction to waterholes and provided the sheepherder with a pastime while herding his flocks." 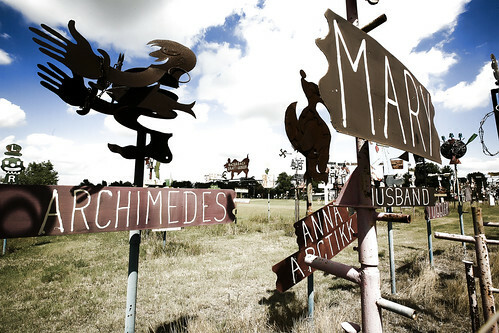 The Geographic Center of the U.S. is not where you’d expect. Furthermore, it’s not where my 2004 Atlas said it would be. After spending an hour-and-a-half combing the area, I know. North of Belle Fourche (Bell Foosh), South Dakota on Highway 85, just South of Junction 168, my Atlas in bright red said: “Geographic Center of U.S. Marker”. From setting my sights on a grandiose solo road trip self-portrait at the geographic center of the United States of America, the search dwindled to looking for something as tell-tell as a unique T-Post in the frozen fence line. Incredulous the grandiose was not forthcoming, I became desperate to find something and perplexed as to what could have happened to a marker of such importance. 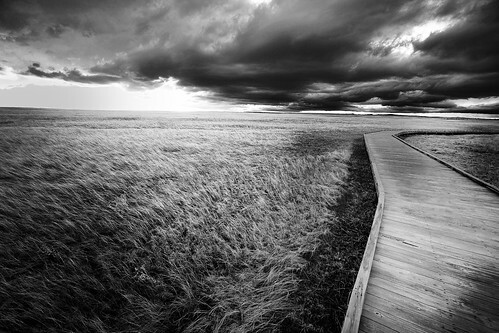 Blood pressure increasing, my eyes landed on the remnants of an old paved road. No gates, no signs, with just enough pavement and old footings to indicate something of note stood here at one point, I excitedly drove around the site to get my bearings. 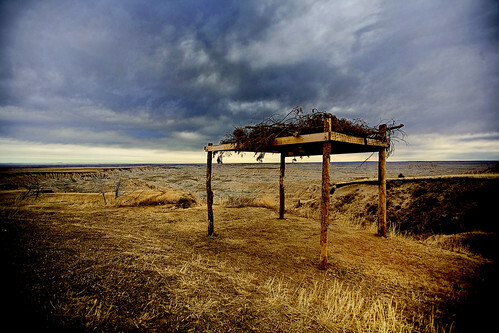 Perched above the disintegrating pavement and towering above the prairie was an area surrounded by a menacing fence. Without question this was something the Department of Interior had gone to great lengths to protect — I’d discovered it after all. Confused? So was I. So here’s my best shot at an explanation. But I warn you, there’s not a lot of authoritative research to rely on and a lot of what follows is disputable. In 1959 the U.S. Coast and Geodetic Survey officially designated a point 13 miles north of Belle Fourche, South Dakota as the Geographic Center of the U.S. (which includes Alaska and Hawaii). The location was surveyed at: Latitude 44 degrees, 58 minutes North, and Longitude 103 degrees, 46 minutes West. Any marker grander than the requisite USGS benchmark in the ground was up to the state of South Dakota to provide and maintain. Around the same time, maybe AT the same time, the Department of Interior built the Monument marker and fence (since it’s on Bureau of Land Management land) for the nearby high-plains cairns of Sheepherder’s Monuments. The State of South Dakota then proceeded to build a picnic area, restrooms, etc. on the site and sold tickets billed for seeing both monuments. Recall previously I mentioned the footings for buildings and the video shows restrooms. The rattle snakes must have felt they weren’t being cut their fair share and laid claim to the area. 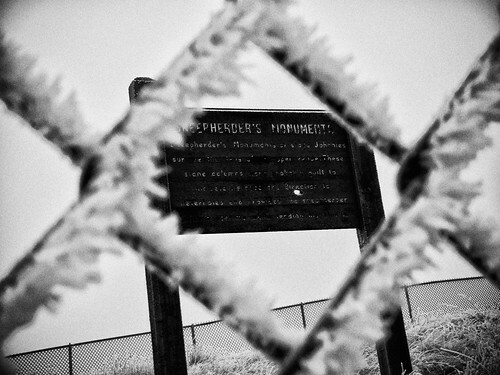 Either the Department of Interior, the state of South Dakota or both, closed and abandoned the Sheepherder’s Monuments’ area in the mid-1990’s. Solo road trippers, caution is ALWAYS justified and should NEVER be disparaged. What you don’t know can kill you. There were no signs warning of rattlesnakes. Had I gone in any of the 3 other seasons of the year…well, I was wearing hiking boots. Given that I’m here to tell this tale, I learned a lesson and should I be faced with such a situation again, I will recall this hell-bent mission to see something and hopefully make a good decision. Eventually the Belle Fourche Chamber of Commerce approached the National Geodetic Survey with a plan to build a new concrete and granite marker IN the town of Belle Fourche making it easier to share the marker with the world. The National Geodetic Survey agreed to the new location and contributed the stainless steel centerpiece of the monument. It was unveiled in 2007. The original marker STILL LIES 13 miles North of Belle Fourche off highway 85 on someone’s fence row, seldom visible, and is but a footnote in history, if that. It’s the marker I want to see. The original USGS benchmark made in 1959 -- NOT my photo. From the top of Sheepherder's Monuments. While not locating the Geographic Center of the U.S. marker, seeing Sheepherder's Monuments, in retrospect turned out to be a very exciting find. I'm glad I made the trek.